LAGOS; 29 August 2018: Travelstart, Africa's leading Online Travel Agency has announced the launch of ‘UberEscape,' a collaboration between Travelstart and Uber to allow customers book flights through the Uber app. In September customers will be able to book their flights by simply opening their Uber app and clicking on ’UberEscape.' Customers will then be directed to the secure ‘UberEscape’ website where they can access exclusive flight deals to some of their favourite destinations. These flight deals are powered by Travelstart. The online travel agency is known for their cheap flights to Dubai, London, New York, Johannesburg and more. The journey to ’UberEscape' will kick off on August 31 with an exciting competition on social media titled “Snap & Share”. During the competition, Uber riders will be asked “Where To?” Participants can pick from any flight route snap a selfie and share it with Travelstart, UBER and their social media followers to win a trip to their dream travel destination. 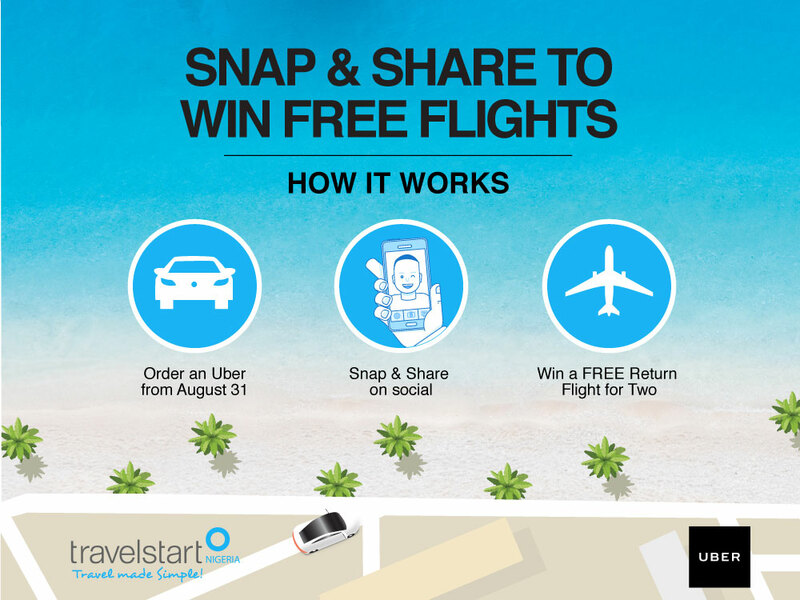 One lucky Uber rider will win TWO FREE Economy return flights tickets! The competition will end September 7, 2018 and the winner will be announced by September 14, 2018. Speaking about the partnership, Commercial Manager, Travelstart Nigeria, Bukky Akomolafe said “We are excited to partner with Uber to make flight bookings even more accessible. With this partnership, customers will be able to book their flights as seamlessly as ordering their next ride via the Uber app.” This reinforces Travelstart’s commitment to making flight bookings even simpler for Nigerians. This is the second partnership between Travelstart and Uber but the first one for both their Nigerian offices. Both technology companies are continually looking for new ways to provide additional value to their customers. ‘UberEscape’ is one of the many initiatives that will help achieve this goal. For more information on ‘UberEscape’, please visit www.travelstart.com.ng/uber. Terms & Conditions apply.